Cucumber grower Herman Keijsers has been working with the Qlipr system since 2003. Full of conviction: according to the grower and advisor, the system is easy, flexible, sustainable and efficient. "We save about a third on the number of hours, compared to turning in. Partly because of this, the investment in Qlipr clamps and hooks is recouped within five years. " 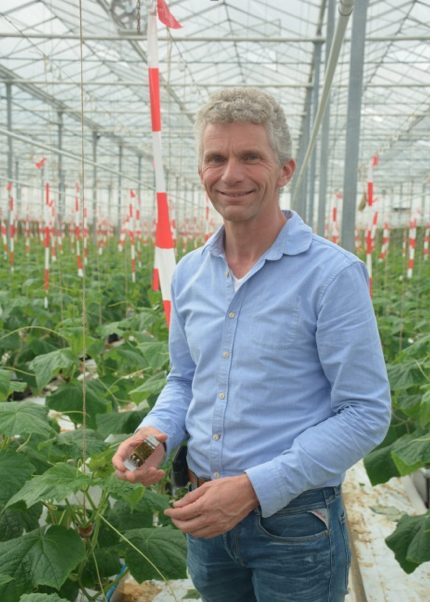 The company of cucumber grower Herman Keijsers covers 1.8 hectares of greenhouse in Veldhoven, and last year Keijsers took a share in a 6-hectare location in IJsselmuiden. Since 2008, Keijsers also provides crop advice to cucumber growers around the world. Thirteen years ago, Keijsers invested in the Qlipr system of Pellikaan Gewasklemsystemen. "I mainly moved on because of the simplicity of the Qlipr system. Employees have mastered the system quickly. " In addition to simplicity, Qlipr also generates a substantial labor gain, says Keijsers. "We move the clips six times, from planting until the plant is at the top of the wire. We performed for nine rounds, so we save three rounds. The traditional system takes a bit more time during tying and first time locking. On the other hand, clipping in the rounds takes a little longer. All in all, with Qlipr we save at least a third of working hours compared to turning in. " Thanks to these savings, the investment in the Qlipr system can be earned back within five years, according to Keijsers. "And the clips and hooks last a long time: we are still working with the clips that we have purchased in 2003." Another advantage is that the Qlipr system offers more flexibility: "Clipping a day earlier or later is no problem. With an expansion of my company, I would no doubt choose Qlipr again. "